These goodies need a loving home. :) . The only item not pictured but included is a full, sealed, 50 yard spool of May Arts white 3/8" polka dot sheer ribbon! I will be teaching a class tomorrow (Monday) and will be checking back Tuesday morning and will post the winner Tuesday afternoon. Please leave a post (one post per person please) and if there is not a link to contact you please leave your email addy. A random number generator will be used. If you post, please let me know what your favorite t!m product is, and if you'd like to, tell me why it's your fave! Winner will be picked Tuesday afternoon, February 12th. Thank you and good luck!!! contest closed - winner posted in above post & thank you! Wow...what fantastic products! And how kind of you to share: My favorite TH procuct is the Stamp Pad Cropper Hopper Case - it looks cool and unique, and it practical as welll! Hi Cindy...that is some super candy! I quite like a number of his products (but my talents don't really lend themselves to that type of art...sniff!). I quite like those World Traveler stamps since I am always a sucker for new stamps! Wowwhat fab-o items...i'd be more than happy to give them a new home *tee hee* I love TH items but alas I have none (yet). Easy choice...When I think of Tim Holtz products, ink is the first thing to come to mind. Now, don't make me pick a favorite of those! I love the distress inks and the alcohol inks. His new ruler looks awesome - I have to get one. But I just bought some of the alcohol inks and am having fun playing with those!! The effect is so cool. Wow. Hard to choose, so I'm going to pick my most recent favorite. I've just added to my wish list the Stampers Anonymous Spills & Splatters Stamps. I love controlled chaos! Wowza ... what fun stuff ... I love his rubber stamps the best. i really don't know that much about tim's products, but i use a few of his ranger distress inks. I am a TIMHOLTZ-A-HOLIC!!!! I love anything and everything that man puts his name on!!! I think the things I use the most right now are the distress inks...they are very versatile. I just purchased the ink case and am dying to put my stamp pads in there! He's the greatest! Thanks for sharing - I hope I win!!!! Hi Cindy! Thanks for the chance to win some great candy. My favorite t!m product is grungeboard - I can't wait to get my hands on some. Only one fav product of his? Oh that is too difficult, I love all his products. My newest fav has to be the Grunge board - can we just say yummy?! Great products, thanks for sharing. I love the distress inks, the colors are just great. they never overpower, but always accentuate. I am amazed at the newest stuff that Tim featured on his blog...I have an order of grungeboard on it's way...that stuff looks incredible. Thanks for the great giveaway! Hi! What a wonderful give-away! I love all the Tim Holtz products, but my favorite has to be his grungeboard. I love how flexible it is, so easy to use and how well it take color media. I love the distress inks too. I need to try more of his products! Ooh awesome products! They can come to my home any day! My fave product is the edge distressor - I use it almost every time I make a card. I really like the distress inks. I have his DVD and have gotten so many ideas from it. Poor little orphans, they can come live with me and I will give them lots of love, I promise! They would love it here! Man would I love to give those a new home! Tim's distress inks are fantastic. Thanks for the chance to win. Nice blog candy and an easy question! I love the Distress inks. I love to sponge them around stamped images or to distress designer papers. I just saw a video for the new texture hammer... that sure seems neat!!! Grungeboard!!! Love the blog and the goodies! Hi Cindy! What great blog candy - thanks for the chance to win it!! My favorite Tim Holtz product would probably be the distress inks, although I really like my tonic/TH paper distressor. My favorite tim product is..well TIM!!! Ok you were talking products huh...I love the distressing inks. I love the inks! LOVE everything - but the inks are my fav! My favorites of t!m's are: the hammer and the grungeboard. And I am gonna get the ruler ASAP!! How generous of you to give away such wonderful "stuff". Wowzers! I love a god give-away and yours looks GREAT! My favorite TH is the distressor. It makes distressing *so* easy. What fabulous candy. I really like the nugget tins! I'm with Kookie.....I love T!M! I have had to practice restraint so I don't have many of his products. I love the alcohol inks & his Tonic scissors, tho! WOW, love your loot Cindy!! Fun prizes! I like the Distress Inks. The way they blend and soak in the paper is perfect for scenic background stamping. I'll have to pick the distress inks since I have several. I love the distress inks but have to say that new ruler sure looks like a must have. Oooh! My favorite t!m product has to be grungeboard right now. I'm also a big fan of the distress pads! You're so generous...I think my favorite is the distress inks...so many possibilities..
My favorite Tim product is the alcohol inks! What great candy. My fave T!m product is distress inks. My hands are permanently stained because I gotta stress it allllll! LOL! Thanks for the opportunity to win! thanks for the chance at the fabulous blog candy! WOW! What fun is all that! I love the tim distressed ink pads. I have only 6 different colors but I use them quite often, they are such an easy way to add color to white, or depth to color! Are you flippin' kidding me!!! OMG!!! Is that Grungeboard I see??!?!???!??! WHOOO HOOO!!! Look at all this FUN stuff. Count me in on this sweet RAK. You are going to make 1 stamper very happy and use their creative mind when this shows up in their mail...and I hope it's ME! I love all Tim's products, but right now I only have some of the distress ink. I like using it for that vintage look. Thanks for a chance. I'm a HUGE fan of all Tim's products. I don't have a lot of his stuff yet. One thing I use all the time is the Antique Linen distress ink. I find if I have something that the color is not right or too bright, dab some of that on there and it always fixes it up. Stuff of Tim's on my list to buy: design ruler, grungeboard and fragments! I have all of Tim's distress inks and use them more than any other product except my glue. Can't leave home without them. I absolutely love the inks that he has. To me they seem so vibraint and so much fun!!! Thank you for a chance to win some wonderful candy!! Aaaaaaahhhhh!!! This stuff is awesome! My favorite right this very moment is the crackle paint...but I so want so much more of his stuff...then I can make a better educated favorite list! Wow, what an awesome giveaway! Thanks for being so generous & for this chance to win! I love Tim's distress inks! Oh my goodness, what a fantastic giveaway! Thanks so much for sharing! I think I love the distress inks..can't wait to get my hands on it..pretty soon! and the next best is the new ruler! I love Tim Holtz stuff, it all rocks! It would be hard to limit it to one thing, but if I have to, I think the grungeboard is the new coolest thing, with the crackle paints second in line by a hair. I love grungboards flexibilty and versatility. Love it, Love all his stuff, love him too! HI C, WOW - what a generous candy! Some lucky crafter is gonna have that christmas feel all over again!! Wow - I spy grungeboard in there - would love to have a play with that! Thanks for the offer here. I guess the product I use most are the Distress inks. In fact, I rarely make a card without using them somewhere. I find them so versatile. I have a couple of his distress inks and LOVE them. The colors are great and like any other out there. I haven't tried anything else but hope to as he's such a unique artist. What super yummy candy! I love TH! Thanks for the chance! Who knows... it might be my lucky day! lol! Wow! Yummy blog candy! By far, my favorite TH product is the distress ink. Can't live without it. Thank you!! wow great stuff! My fav is the distress inks nothing works better, but i am really liking alot of the crackle paints too! Recently discovered your blog and enjoying it very much. My favourite Tim Hotlz product is his distress inks. I love Tim's products, especially the distress inks. Hands down Grungeboard and Distress Inks. Grungeboard is awesome to work with and lately I've been distressing quite a bit. Thanks for the opportunity to win blog candy! Oh, such great candy, thanks for entering me. I am dying to get some distressed ink pads and alcohol inks to try. Idon't have any yet, but can't wait. Thanx. WOW - that's a serious gift!! My fave Tim creation is the texture wings stamp - I love butterflies!! Wow - what an awesome give away! My favorite Tim product is his distress ink. I love all of the colors that I've used. I wish I lived closer to take some of his classes! Holy Toledo Cindy Lyles! Hey I hope you are feeling better! I would love to take your class! By the way, my favorite Tim Holtz product is the distress ink! I love all of his stuff though because of you!!!!!!!!!!!!! This is amazing. What a great give away. My favorite is the Tim Holts ink pad carriers. Wow what a great giveaway. Thank you so much for the chance to win. I have too many favorites. WOW Cindy, that is some great stuff! I am loving TH distress inks and am slowly building up my collection. So far, it's the distressing ink, but only cuz I haven't had my hands on anything yet! I am always using the distress inks...love fire brick and aged mahogany ! So, they must be my fave right now. I have most of his products but haven't used them all yet....I will though! It is hard to pick just ONE favorite product, but the one I use most often continues to be the distress ink! Wow! What a load of goodies. My favorite Tim Holtz product right now are the distressing ink pads. I would love to use his grungeboard though...I think I see some there in that pile...hint, hint :). Oh what wonderful goodies! yay! My favorite T!m product is T!m himself - lol! He's so awesome. But I guess that wasn't what you really meant, so I would have to pick his distress inks because I use them so much. I am also into his alcohol inks, and his distress embossing powders. Thanks!! Well this is my first post, and I must say I have just been a lurker and loving what you do. My favorite Tim Holtz item would be the perfect ruler, I think that is what it is called. I do not own any of his stuff, but love the look of the ruler. Tim's grungeboard looks like so much fun! I too like his distress inks. awesome candy!! My favorite is the distress ink!! WOO HOO, that is some Yummo LOOT. I think it wants to live at my house! I love Tim Holtz Distress inks! The Walnut is my FAV and most used. I also Love the Crackle Paint...Oh my...FABULUST! Man..he makes good stuff! Thanks for sheltering those goodies...Let's make this adoption FINAL! LOL! Wow, Cindy! What great blog candy! My favorite Tim products are the Ranger Distress inks. Love them! These are all fabulous items Cindy! I have to say that right now I'm totally digging Tim's grungeboard and his distressing hammer. It's so easy to make embellishments look like aged hardware with this stuff. Thanks for the chance to win! WOW - what great stuff you are giving away. That is one fun bunch of stuff. I love your site and get such inspiration from it. I love the TM distress inks. Thanks for the chance to win! I have to agree with the other gals about Tim's inks, they rock ! WOW. Well, I don't know if I COULD pick a favorite. I have his distressor tool, his inks, his paints, his embossing pwdrs, many of his exclusive stamps, but I guess I'd pick his Alcohol inks. Just fab! I'd have to say grungeboard. That stuff is amazing. You can do anything to it and never have to worry about it tearing or messing up. That sure is some nice blog candy and would love to win! Well, I'm the winner of Tim's recent giveaway so I'm a big Tim fan and of all the products I own I keep going back to the Distress Inks. They do a great job and clean off the stamps so well and there are so many nice colors for the vintage look. Sweet, sweet, sweet! I haven't had any opportunity to use them yet but I love the effect the distress inks give. I really can't pick, but I know that I use his distress inks the most. Have yet to try the Grunge board. It's on my "Wish List". This is such amazing candy! WOW!!! Thanks! I think my favorite Tim Holtz product is Tim Holtz himself!!!! He is such a creative genious! I love his distress inks and embossing powders though. His new grungeboard is something that I've been wanting to try too! Hmmm it might be the distressed inks if I had any!!! Oh, that's a hard one. I think the distressing inks are my favorite. They are so versatile, I just love them. My favorite would have to be the non stick scissors! You don't have to worry about the goo sticking to them! It save tons of time spent cleaning them! I really like his distressed ink colors! I love your altered items ideas. I love Tim Holz products, Especially his grungeboard. What an awesome prize package. Wow, some yummy candy! My favorite product so far would be the distress ink. I love to add interest and dimension to my projects! I love anything Tim Holtz - just love that distressed look. My current fav is probably the crackle paints - very easy to use! Thanks! Geat giveaway!!! I've not used any TH product yet but want to try out the distress inks! Wow, super yummy candy! My favorite are the distress inks, especially Walnut Stain. Love it for sponging on cards for its freat distressing look. Thanks!! My favorite t!m product is whatever you used last - and I would love a private lesson with you to learn how to create any one of the amazing things you share. OMG.... Wow Cindy... you are GENEROUS! My favorite Tim product is whatever you are using at the moment! :) LOVE YOU CINDY LOU!! First thing that comes to mind is his Distress Crackle Paint. Who would have thought you could paint cardstock (chipboard, etc.) to give it that weathered aged look. Genius! Wowsa, what a yummy bunch of blog candy!! Everthing Tim makes is awesome, including the new grungeboard (love it! ), but the one product I use over and over is the Distress Ink pads. I've got 'em in every color and reach for one of them daily. Distress inks. I don't have but one so far, but I love it! Hi Cindy, read your blog all the time. Ohh, great giveaway. Of the TH products, I would have to say the distressed inks. Thanks for the opportunity to win these great gifts. Hi Cindy - Well, I also love the distress inks..I have lots of his colors and love every one. thanks for the chance to win this! Can I choose something that I don't have, but am waiting "patiently" for the LSS to get in so I can play with it and I KNOW I will love it? Anyway the grunge board! I can't wait to use it. i love his distress inks. Awesome blog candy! I love looking at your blog, you do such lovely work. I'm into the Distress Crackle Paint these days, love that stuff. Wow, where do you begin - I would have to say the grunge board. I have some of it and it is amazing. I love the durability of it! However, I love all his stuff! 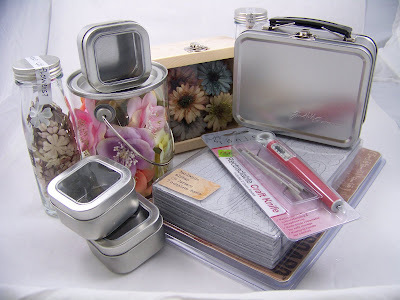 My favorite tin is the lunch tin because I would love to keep all of my supplies and cards in it. Thanks, Cindy. My favorites are the Tim Holtz Distress Inks. They are available in a lot of colours and easy to use for many purposes! Well that's hard to pick. The distress inks are awesome but the alcohol inks are so much fun! Wow, we have to choose only one favorite? I guess that would have to be his alcohol inks, but the blending solution would come in second. I have not found a single product of his that I have been disappointed in. They are all awesome! Your so sweet! I think my favorite are the tins. I'm keeping my fingers crossed I'm the lucky one!! I'd have to say the distress inks. They can be used for anything. Wow! What a give-away!! I've been playing with the distress embossing lately and love the look. I love anything Tim! I think right now my favorite has to be the Grungeboard. Thanks for the cool candy op! My favorite of Tim's products has to be the Distress inks. There's no end to how this wonderful product can be used. He seems to find more and more uses for them. Thanks for sharing. That's quite a wonderful pile of goodies that you're giving away. What a fantastic giveaway! I really like Tim's alcohol inks...love all the effects on glossy paper. What do I love the most. Well I love Tim himself. What a fabulous source of inspiration he gives us out here in the crafting world. This is wonderful "free stuff". That is so generous of you. Love your free stuff...especially those tins!! My favorite TH product is the Ranger Distress Inks. Wonderful look!! How generous!! I would just love to try the retractable craft knife! I think my fav TH product is still the Distress Ink! I've never used Tim's products, but am so excited that I just learned about them. I'm a new stamper and love the tips on your blog. Thanks! Wow. What an awesome giveaway!!! I love the cases, the color is so awesome. Thank you. Wow! You are over the top generous! Looks like a very fun pile to create with! Thanks for all you share with us. I love your style and creative touch! Great Candy and they would fit perfectly in my organized craft cabinet! Hard to pick a favorite item when they are all fabulous! But I think I would have to say the ink! I love the distress inks. I have to say I have never tried Tim Holtz products. I enjoyed the comments on what everyone likes best. Great giveaways, thanks! The distress inks are my favorite... I just love them. What wonderful candy!!! TFS. The only thing I have tried is the distress inks. I think they are pretty cool. I plan on trying more products later on. Thanks for this great giveaway! Would it be really bad to say I haven't used any of Tim's stuff??? I keep wanting to try it, but haven't had the cash to buy anything. I've seen wonderful things done with the distress inks. . .and his cases look amazing as well. . .heard lots of good about the grungeboard. Guess I really need to get out there and try something out! Always wanted to play with alcohol inks. . . . . . Awesome giveaway! My 'Tim product' is the Tonic scissors with the anti-stick. They are on my list of things to order and I can't wait to try them. Gotta be the distress inks....I am well and truly addicted! The ink pads are very juicy and go on so beautifully!!! WOW! You sure went all out w/this giveaway! I like the Distress Inks. They are just so versatile. My favorite TH product is the line of distress inks! I use them all the time. Thanks! I love the Adirondack inks. I bought my first one 5 years ago and it is still going stong. I dont have stuff from T!M but I want to get some distress inks and stamps!!!! Wow, what great stuff!! So far, all I have is the Glossy Accents. I would like to try the distress inks because I really like the way stampers are using them. ~HOLY COW!~ That's a ton of candy! The grungeboard and clear "all in one" ruler are the BOMB!! Enter me to win..thanks! wow, those are some amazing goodies!! My favorite is the distress inks of his! I love Tim Holtz products! My favorite has to be the grungeboard! I just love it's flexibility and the many ways you can use it! Wow what a wonderful give a way! its hard to pick justone,but alcohol inks would be first and i i just finally used my first distress ink pad! the colors are wonderful! Hi Cindy! ... what an awesome give away. I really like the new ruler he has and also the Fragments look really cool. I don't either yet, but hope to soon. Gotta love blog candy! Thanks for the awesome opportunity to maybe win some great goodies. I love product that Tim promotes. Oh, my gosh! What gorgeous stuff! It is so kind of you to share such wonderful products along with all your talent and great ideas. Hey I just heard about the blog bacon. I must say I am super intrigued with Tim's new ruler he showed on his blog. I gotta get this for sure. What an awsome prize package! My favorite Tim product would be the distressing inks. I love all the colors. what a fun group of goodies you have here. Wow my favorite product, there are a few I haven't had the chance to use yet, but if you can call it one of his "products" I would have to say his DVD's so I can watch him do his work over and over again! Wow! What a candy! I love all TH products but I am really getting to love his distress inks and I am soon going to purchase some of his grungeboard as I am drooling over it. Awesome giveaway's, Cindy! I would love to get my hands on some of Tim's grungeboard! What fun! Hello Ms. C.L.! I love the grungeboard best...and the alcohol inks with pearly/metallic addatives, and the acrylic squares, the distress crackle paint, and well everything he touches I like...does that answer the question? Tim Holtz, o h m y...to choose just one, dont think I can do that. The distress inks are fabulous, I use many, the grunge board is the greatest...his stamps are wonderous...I can go on and on....and Tim Holtz himself is just amazing. What more can I say. Omygosh what an exciting prize!! These are all such awsome products. Hmmm.........Fav. TH product would definitely be the distress inks. Would not live without them. Oh my goodness!!! What awesome blog candy you are offering!! So generous!!!!!!!! Thanks for the chance at winning...PICK ME!!! Oh my favourite TH product that I actually own is distress inks, they're awesome, but I am also totally in love with his stamps... someday I'll have some of my own! I would have to say the distress inks are my absolute favorite product! I love the new Grunge Board! I watched his video, was shocked when he crumbled it up in his hand-then just like magic-----Good as new!! Wow, now I wish I could find it in CO! I love the new grunge board and all of the distress inks! I really like what I've seen about the new grunge board, I haven't had the opportunity to try it yet though. If all that stuff needs a home, I will welcome it into my house!! Thanks for the chance to win some great stuff! Favorite "Tim" product??? Since I haven't TRIED the grunge board yet, that doesn't count. But I LOVE LOVE LOVE the alcohol inks, and the distress ink pads. And I love what you do with all things T!m! I just bought 3 colors of Tim's distress ink on Saturday. Haven't had time to try them out yet but am looking forward to it. Thanks for the chance at your blog candy. Wow - great candy! My favorite TH product is Grunge Board. Wow, what awesome blog candy! You are way too generous! TH has beautiful alcohol inks - a beautiful color selection. My fav is the grunge board! I know it is new (ish) but it is da bomb! Love it! OOOO I wanna win! I love the grungeboard! I like that is is so manipulable. I can do whatever I want to it and it won't disintegrate. It's indestructible! I've only had limited exposure to TH but LOVE the alcohol inks. I'm dying to try out the distressed line but haven't had an opportunity yet. THANKS for the great giveaway and your awesome blog. Oooo - that's some ice free stuff - especially love the flowers. did someone say TINS? This is by far one of the best loving homes they could have. Thanks for such an awesome giveaway. Love your blog. I like the distress inks and am learning more about Tim's products. Wow such awesome goodies. My favorite would be his Distressed Ink pads. They add so much to any project. What a fabulous collection of goodies! My favorite TH product is the alcohol inks! I just love all the looks you can get with them! All content, including text, photographs and concept design elements are ©Cindy Lyles, StarLitStudio. Please use the contents of this blog for personal, non-commercial use and inspiration. Splitcoaststampers - It's a stamper's mecca. The following text will NOT be seen, please keep it in order to retain your counter functionality http://www.marcoislandtalkradio.com/?cat=3 online spielautomaten.